The sweeping change across the Middle East has taken many by surprise. Although some had talked about change setting off a domino effect, they did not expect it to be so sudden, with such power. Due to this sudden change, there is a political vacuum, which the west is trying to fill with a cautious call for democracy. They are cautious because various reports, surveys and intelligence all indicate that political Islam is waiting in the wings looking to fill this vacuum. Faced with this reality they are formulating policies on how to reign in the “Islamists”. They talk of the ‘politics of inclusion’, which they feel they have successfully used in Turkey to control Islamic political parties. But they are fully aware that the Middle East is not Turkey and currently there is no support on the ground for secular democracy. For us to understand what they are planning for the region we need to examine how they have dealt with the Islamic parties over the last 40years. The commonly quoted examples of successes of Islamic political parties in democratic elections are the Islamic Salvation Front in Algeria (1991), the Justice and Development Party in Turkey (2002 and 2007), and the Islamic Resistance Movement (Hamas) in Palestine (2006). In all these cases they have managed to contain the influence of these parties and have worked, in the long run, to secularize them. The key in all these cases has been the military, the power which upholds the system, which remained secular and guaranteed the continuation the system. Indeed, over the last forty years Islamic political parties have stood in 89 parliamentary elections in 21 countries (Source: Inter-Parliamentary Union). Over the years a multiple Islamic parties have entered the democratic process fighting for the same vote, splitting their constituency and hence having minimal impact. In Indonesia there are as many as nine Islamic parties competing for the same vote. When we examine these Islamic parties closely it is not clear what Islam they intent to implement in society. Some parties advocate Shariah and some like Turkey’s Justice and Development Party (AKP), which is known to be an Islamic party, has removed almost every reference to Islam from its electoral platforms, and now describes itself as a “conservative” political party. Democratization or liberalization was one on the top three issue for 11 platforms. Mixing Shariah, democracy and liberalization in these platforms clearly showed that these parties were not clear about what they stood for and hence their results at the polls were unimpressive. In their attempt to enter the democratic process they compromised and lost the trust of the electorate, it was also hard to account them on their promises as they played a deceptive game with the authorities. 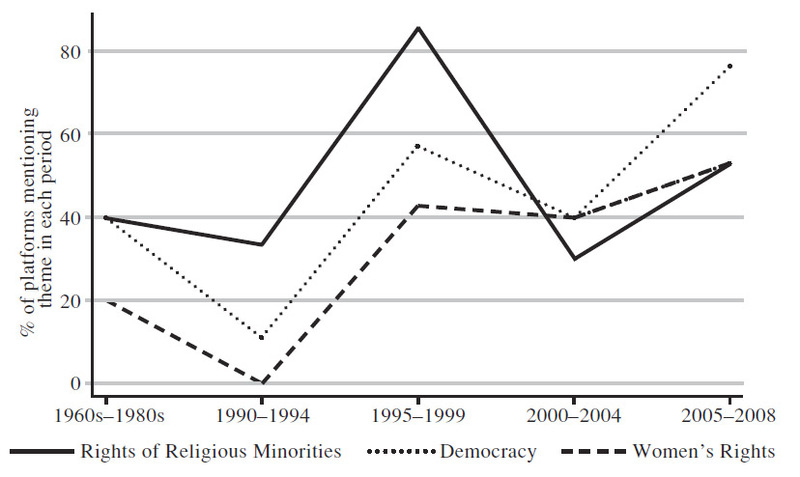 The impact on the Islamic political parties entering the democratic process can be seen in the graph below. There is a clear tendency towards liberalization. 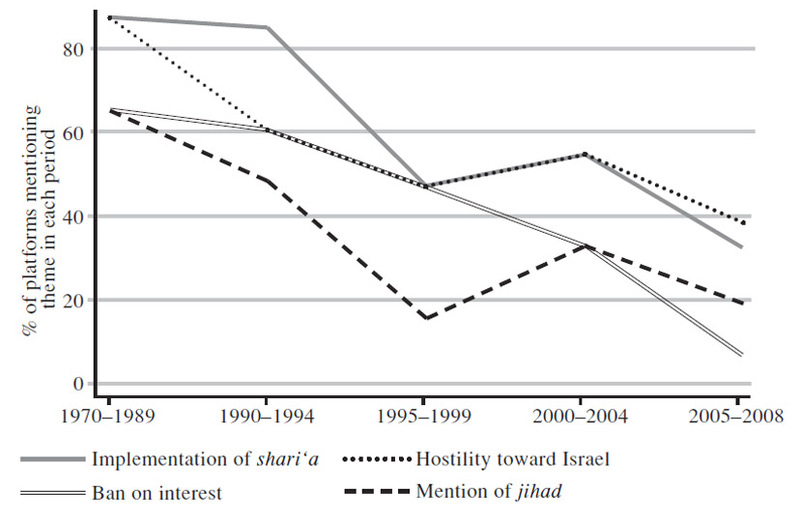 A study showed that prior to the mid 1990s a majority of the platforms favored the implementation of Shariah, a ban on interest and made some mention of Jihad and opposition to Israel. Since then more than half have dropped such claims and adopted more liberal values like calling for women’s rights and democracy. The study concluded that “Islamic parties have (relative to their starting point) liberalized their stances significantly over the past several decades”. This was the case with the Renaissance Movement in Algeria, the Islamic Action Front in Jordan, Jamaat-i-Islami in Bangladesh, and the Justice and Development Party in Morocco, which dropped their support for the shariah. Also another point to note is that no party added a call for Shari‘a to its agenda. Some parties which had referred to Jihad such as Egypt’s Muslim Brotherhood, Jamaat-i-Islami in Bangladesh, and the Yemeni Congregation for Reform removed the term from their platforms. The process of political participation had the desired effect of secularizing these parties completely; they openly embraced the norms of democracy and human rights. This not only occurred at the party level but also at the individual member level. It was noted that before electoral success members would not shake hands with women and participate in interfaith dialogue, but after it was not an issue. Over the years as the Islamic parties competed with the secular parties they have moved towards the center of the ideological spectrum. They are seen to be no different to mainstream secular parties. As the graph above show they have compromised on those issue which defined them as Islamic. This should be a clear warning for those Islamic groups that wish to bring the Shariah through the ballot box as not only is it against the Sunnah of the Prophet Sallalahu Alaihi Wasallam but it is falling in to the trap that the colonialist have laid for Muslims to compromise their Islam. This attempt of the Kuffar to find a middle ground between Islam and Kufr and hence weaken and compromise Islam is nothing new. The Quraysh in Mecca realized that fighting the Dawah of the Prophet (Sallalahu Alaihi Wasallam) and the Sahabah through oppression, torture, boycott, slander only strengthened the call to Islam. Hence they concluded that they would adopt a policy of reconciliation i.e. a policy of Inclusion. The Messenger of Allah (Sallalahu Alaihi Wasallam) came to them quickly, believing that there had been a change in their attitude to him. He was eager for them to accept the truth for their error, which was painful to him. He sat down with them. “They said `O Muhammed, we sent for you to reconcile with you. By God, we know of no Arab man who has ever brought his people as much trouble as you have. You have reviled the forebears, criticized the religion, ridiculed the values, cursed the gods, and divided our community. Every unpleasant thing possible you have done to make a rift between you and us. The Messenger of Allah replied. ‘What you have said does not apply to me. I have not brought you my message seeking your money, nor honor among you, nor sovereignty over you’. From this section of the seerah it is clear that the prophet (saw) clearly rejected their offers as it was an attempt to compromise and dilute Islam. The objective is not to seek power for the sake of power as demonstrated by the prophet Sallalahu Alaihi Wasallam. The objective is for them to accept the sovereignty for Islam only and not some half baked shariah and Kufr mix which smell of capitalism.